The Eat, Drink, Earn philosophy is all about rewarding our members for their loyalty by offering a range of promotional activities, discounts and exclusive offers as our way of saying thanks for being a customer of Welcome Stranger Hotel. Members that have signed to receive emails or direct mail will be sent exclusive members-only offers. 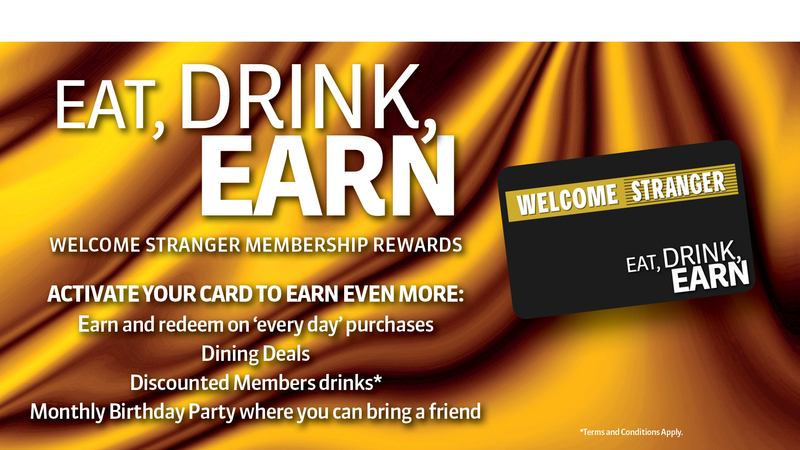 Members can earn points by swiping their membership card on every transaction. These points then can be used to purchase food and beverages in the Hotel. Members can also earn points by swiping their card at the Kiosk located at the entrance of the Hotel. The membership kiosk is also where members can earn Bonus Points, go into the draw to win amazing prizes and receive exclusive member offers. Sign up today and Earn even more!